Introducing "Silk," who as it turns out is not Spider-Woman. Smack dab in the middle of this summer's "Original Sin" storyline, Marvel is mixing thing up - or, if you like, making things even more convoluted - in the Spider-Man mythos. 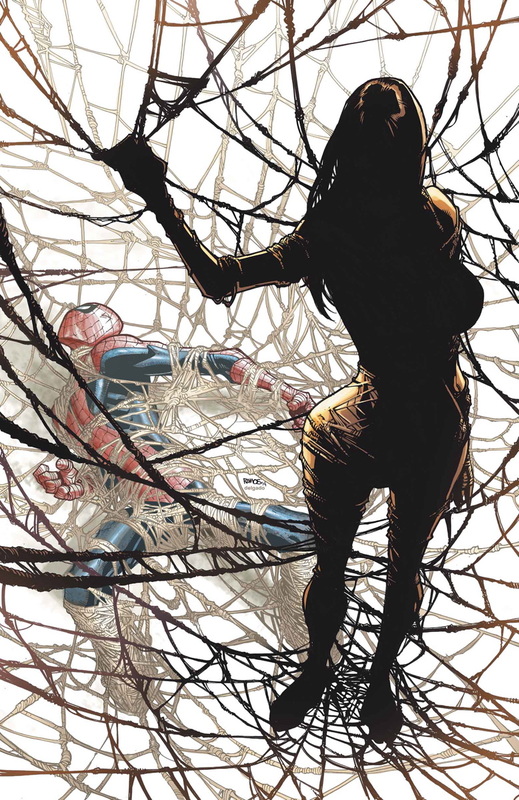 This July on the pages of Amazing Spider-Man #4, Marvel will introduce "Silk," a young woman who as it happens was also bitten by the same spider that gave Peter Parker his spider abilities. Marvel revealed the new character over the weekend during a panel at C2E2. After her debut, she will feature in an ongoing story expected to last several years. 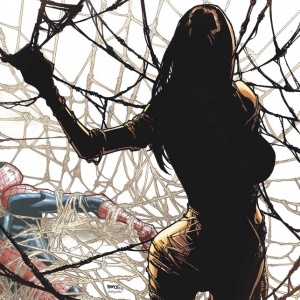 Said Marvel Senior Editor Nick Loew: "Silk is going to be a major Spider... character over the next couple years. She got bit by the same spider that Peter Parker did and we're starting to tease her story in every issue of Amazing Spider-Man." No further details about the new character were presented aside from a page from her debut issue and a variant cover, which indicates her costume is made of webbing, somehow. Presumably she will likely not end up learning "with great power comes great responsibility," at least not in the same way Peter Parker did. On the other hand, some fresh perspective on the concept of Spider-Man might breathe new life into a series that has become almost insufferably Soap Operaish over the last 20 years. With Peter Parker soon to return to life after two years dead (and Otto Octavius having picked up the mantle), a sort of mirror image of his life might provide interesting perspective. We'll all see for ourselves come July. Here's the full variant cover, courtesy of Newsarama. What say you, commenters? Interesting concept, or just a few inches dug deeper into an already vast hole? Sound off in comments.